The above error message has been popping up for me recently any time I make a post (in red text). I does not matter if I am embedding links or images or not. I have had to re-submit my message to make it finally post. Two tries every time. Also, I'm still logged out any time I return to the site (the issue I first reported when the site resumed post-crash). It never remembers me, except occasionally on mobile. Re: The submitted form was invalid. Try submitting again. I've had to resubmit any time I try to post photos. 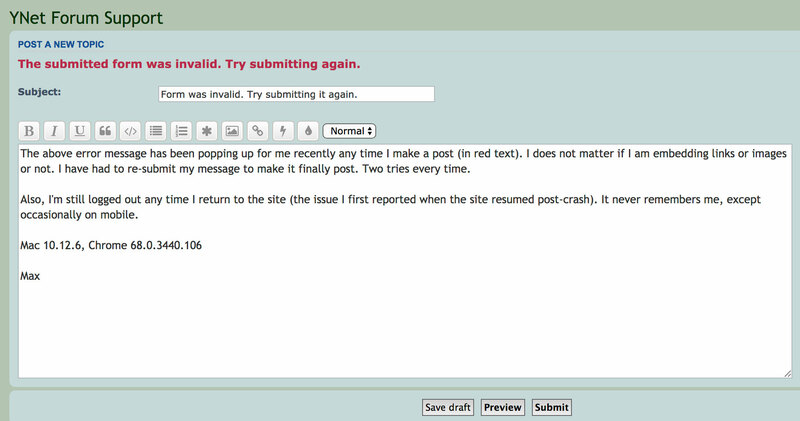 Funny, I got the same message when I tried to preview before submitting. I just hit submit and had no trouble. I've been having the same problem. And now I can't post any pix.